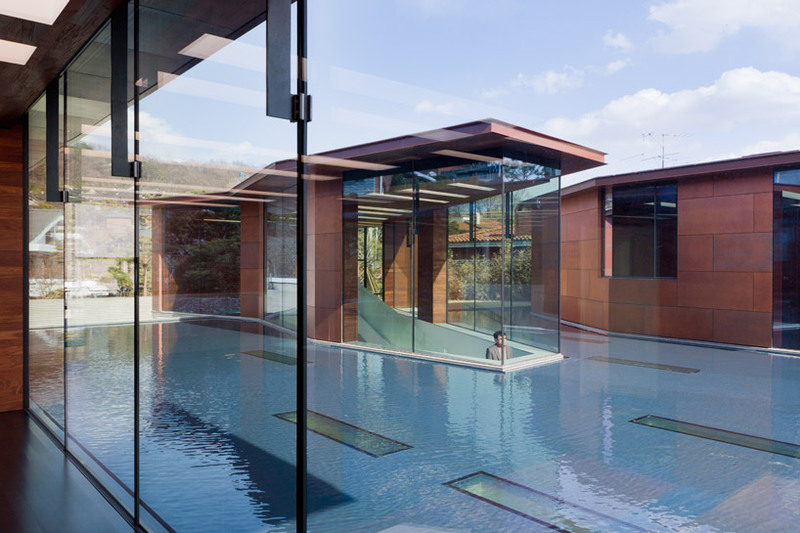 new york-based firm steven holl architects has completed the ‘daeyang gallery and house’, a residence situated in the kangbuk area of the city at the base of picturesque hills in seoul, korea. the dwelling and event space within three pavilions are linked with a pool, separating the internal programmatic spaces. an entry structure with reception leads to a separated dwelling and multifunctional space which rise above above the plane of the water’s surface, while the gallery is set below grade. as visitors descend staircases into the exhibition area, views are framed through the windows to opposing pavilions across the central pond. geometries are derived from the 1967 sketch of a musical score from ‘symphony of modules’ by composer istvan anhalt. spaces remain ‘silent’ until they are activated by the natural light which streams through 55 linear skylights. five strips of clear glass bend the sunlight into inner spaces, allowing seasonal and daytime sun angles to change the experience. dappled light reflects upon the white granite floors and plaster walls of the basement display. rooms are consistently formed in proportion to the series of 3, 5, 8, 13, 21, 34, 55. Beautiful! Love the bamboo texture on concrete and the colour of the patinated copper!